modlandUSA: Page. Pay. Promote. Puzzled? The word promote at the bottom right of your Facebook posts. What the heck is that? Something new: You can pay Facebook to promote an individual post. The post I took this from, without any promotion, reached 885 people. Thanks Facebook for now including those statistics with the posts: It IS important to know what resounds with the fan base. However, Mr. Zuckerberg, why would I want to pay $5 to reach 1,000 when the posts has nearly achieved that with no promotion? 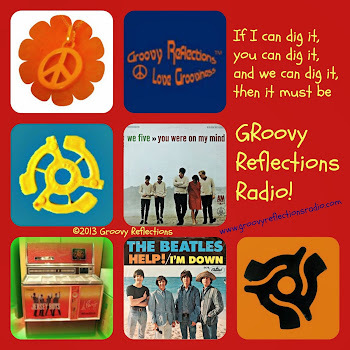 For the Groovy Reflections page the fees range from $5 to $30. The pricing presented appears to be dependent on the number of fans you have. 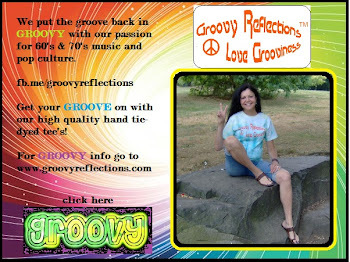 My MODern Marketing 4 U page only offers $5 and $10 promotions since I have far fewer fans there. And furthermore, why would if I pay $30 to reach 5,300 people? There were 4,698 fans when I snipped this example from Facebook so that's more than the number of fans for the page. Ah, of course, this stems from fans liking and commenting on your post; then their friends see it too, thus casting a wider net. Okay. Makes sense. And if you do use the promote feature, what happens? The post you chose to promote will be labeled as sponsored in the news feed. This is different from ads that show up on the right side of the page. Facebook, in their help section on this subject, state that any given posts won’t reach all of your fans. Must be that killer algorhythm doing its thing again. Someday, perhaps we’ll understand why Facebook decides who sees what and how many see it. Yes, it’s frustrating to say the least. 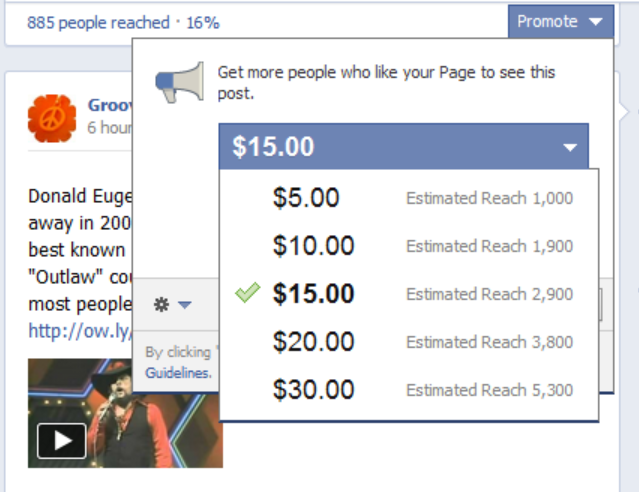 So, in essence, Facebook restrains the audience for your posts and then charges you to reach more of your own audience? Wow. I could say this is a bright idea because there will be page owners eager to pay up for instant results. Now, why would anyone use this service? Perhaps if you wanted to increase sales of your products and run a quick fire sale, here's a way where you could extend that reach instantly. Could be worthwhile if there’s a high volume of product that needs to be moved quickly. It could be used for market research perhaps, a quick poll or short survey where there’s a timely topic and you need data NOW so you can be the first to write about it. The respondents would be luck of the draw unless you put a filter in the survey so you can weed it down to just the folks you really want to pose questions to. However, now we’re talking about a longer survey, which means more folks may bail out, and you’re working against the theory of “quick”. Facebook continues to be an enigma. Will be interesting to learn if this new feature is a success. Will it bring in fresh revenue and be hailed as innovative by the new stockholders? They're likely waiting for something to make the numbers jump up; that is, if they haven't bailed already and licked their wounds. OK I get it now. I've been "puzzled" by a Samsung post that keeps appearing under my newsfeed and features my cousin as the sponsor, it keeps showing up as a sponsored post even though all he did was like that page. Dealing with Facebook is a lot like going through an old Fun House - you never know what's around the next corner! Thanks for this and all your posts. Would rather have the Fun House back from Palisades Amusement Park! Tim, can you gently suggest to your cousin to unlike their page or at the very least alert him to what's happening? Thanks for the info. The puzzle continues to become more "twisty". Seriously don't think he's been doing any marekt research unless "gut feeling" is the new methodology. Instead of the brothers, perhaps Mr. Z should seek advice from Bob Newhart instead. My issue with this Gerry is that what good does it do if it's seen by 1000 or 1 million people? The only reason I spend advertising dollars is for ROI (return on investment). To date, I've gotten more business from Twitter than anything on Facebook. The only time I get business that could be connected with Facebook is when a client refers me to someone else. So, I don't see any value in that at all. Good point Debbie. Twitter IS the hub for some businesses, however, for others, it's Facebook. You and I are both service-oriented companies and yes, I get leads and clients from Twitter and referrals like you do on FB. The new pay to promote feature will likely be more successful for product oriented businesses. 10-4, already done based on this! Thanks for shedding some light on this Gerry! released "FLAWD" clothing , and has barely paid for marketing because of her Youtube, Twitter, Instagram etc. accounts.